Title: 06/17/1986 - Application of the Hazard Communication standard to waste oils. This is in response to your letter of June 17, concerning the application of the Hazard Communication Standard (HCS), reference 29 CFR 1910.1200 to your waste oils. Please accept my apology for the delay in response. Your letter indicates that your company is considering the production of fuel oil from waste oils regulated under the Resource Conservation and Recovery Act (RCRA) administered by the U.S. Environmental Protection Agency (EPA). The process apparently entails the addition of low flash solvents to waste oils to produce usable fuel oils. You ask whether or not material safety data sheets (MSDS) are required for the finished fuel oil product and ask for guidance on their completion. MSDS are required when products containing hazardous chemicals are sold to employers in the manufacturing sector [Standard Industrial Classification (SIC) codes 20-39]. Assuming your fuel oil product is destined for such an establishment and its use presents a potential for employees to be exposed to a health or physical hazard, then a MSDS is required. The Hazard Determination provision of the HCS (reference 29 CFR 1910.1200(d) are used in conjunction with the appendices found at the end of the standard to evaluate the hazards of chemicals and chemical mixtures. Manufacturers may either test mixtures as a whole or report the effects of each of the hazardous components in a mixture. Each MSDS must accurately and thoroughly reflect the product's characteristics. Generic MSDS are permitted as long as this is accomplished. Please feel free to contact us again if further assistance is needed. 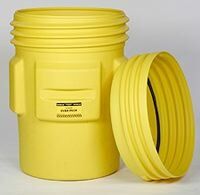 Contain leaky drums with overpack containers from Safety Emporium. Spec fuel oils which would be acceptable for commercial or residential use. The problem we are facing is how to approach the problem of preparing a material safety data sheet, and even when one is necessary. Obviously, hazardous waste fuels would be exempt under 29 CFR 1200. (a) (f) (i) since it would be a RCRA regulated waste. And, if EPA does eventually classify all used oils as hazardous waste (they are currently unregulated) none of the spec or off-spec fuels would be usable in industry or private facilities, so they would also fall under RCRA. The question is, if we blend materials which are sold and transported to us as hazardous wastes (i.e. Xylene, Toulene, and other low flash solvents) into non-regulated used oils and create a usable fuel oil, how should a material safety data sheet be prepared? Is one necessary? Should the status of the component parts, as wastes, be ignored? Since the blend will be to meet fuel characteristic, low flash solvents will be used interchangeably based on the availability of waste streams and blended based on characteristics of the used oil's base. Can we classify components generically and with wide ranges of percentages as ingredients? I think you can appreciate the problem we are having with this. We will not be producing a product that will be highly consistent and we will be producing a product which, for all practical purposes, is nothing more than a destruction process for hazardous wastes. Furthermore, as a RCRA facility, our own employees aren't really covered by the Hazard Communication Standard, although we do inform them on the hazards of each individual waste stream. 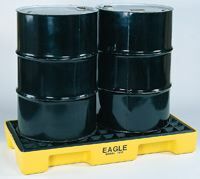 These pallets are just one of many spill prevention products available at Safety Emporium. Please advise us of your opinions regarding this situation. We will look forward to your prompt reply.